For those in sales and business development LinkedIn should be an essential part of your business toolkit. If does not replace communications, presentation, sales and negotiation skills but serves to enhance these areas when used correctly. Here we will give you a perspective on what LinkedIn is beyond an online resume, why it is a powerful tool, and how to use it to become a more productive sales professional. I will be using the terms sales and business development interchangeably here, these concepts will apply to both groups of professionals. LinkedIn is commonly viewed as a platform where you can display the equivalent of your online resume. Though this is true, it far understates the value of LinkedIn. It will serve you well to view LinkedIn as a business tool rather than a resume. LinkedIn is a place for you to display what you offer as a professional including a summary of your personal brand, work experience, accomplishments, certifications, awards, languages and more. If you speak multiple languages you can create a LinkedIn profile in each language. LinkedIn is the world’s largest professional network with over 460 million members and rapidly approaching half a billion members. When Microsoft’s acquisition of LinkedIn is complete its membership could top one billion users. Even more impressive than the size of LinkedIn’s membership is the ability to use its search features to find people of interest. You can search by name, keyword, industry, location, title, school, profile language and non-profit interest (those interested in Board service or willing to volunteer their skills). You are able to publish status updates (called posts), photos and long form posts (called articles) on LinkedIn as well as comment on content published by others. These publishing features enable you to raise your level of visibility within the professional community by sharing original and curated content. In addition because influential business people such as Richard Branson, Jack Welch, Sallie Krawcheck and others are publishing here, executives turn to LinkedIn as one of their sources of information. An interesting study by Frog Dog Research (no kidding..) about how C-suite executives use LinkedIn revealed that they use it as an information resource as well as a networking tool. Today, more than ever potential stakeholders are interested in the people behind the organization. Your personal brand can be viewed as your unique combination of experience, skills, business philosophy, attitude, character and other attributes. Taken together these differentiate you from everyone else on the planet. Most people do not make the effort to think about what their personal brand consists of and how to describe it to others. All too often we spend so much energy trying to compensate for our weaknesses that we don’t give adequate attention to our strengths and what we do have to offer. For business owners their personal brand and business brand are usually deeply intertwined, although those whose strategy involves the eventual sale of the business will want their business brand to stand on its own. Your LinkedIn profile gives you the opportunity to promote your own accomplishments, but it should also be used to promote your employer as this will benefit you and them. Your professional network is one of your most valuable business assets. The people you are connected with are a source of information, sales leads, job opportunities, and a variety of other opportunities. 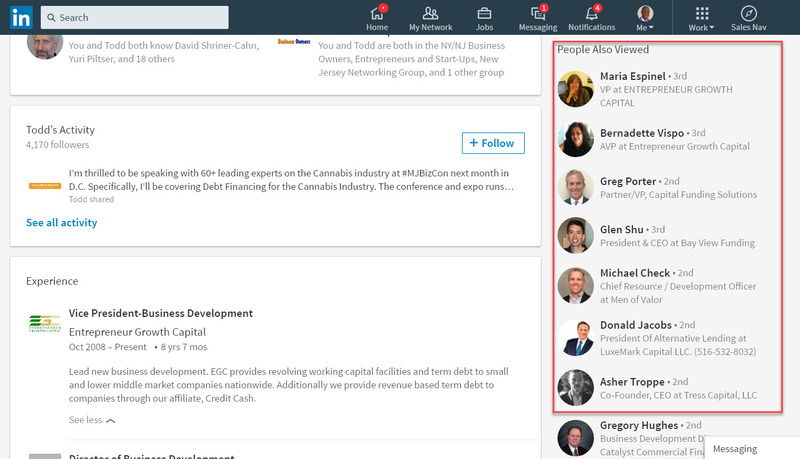 LinkedIn can be used to help organize your network using Tags and gives you visibility into your extended network – those who your direct connections are connected with. In addition, smart employers and others who may use your services realize that your network can be an asset for them if they work with you. Sales professionals can use LinkedIn as one of their job search tools. When you enter a term in the main search bar and hit Enter, you will see the Jobs tab as an option. You can search by keywords, company, title and location, date posted, job function, industry and experience level. A Premium membership will enable you to filter by salary as well. 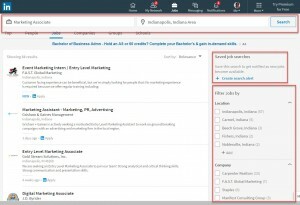 LinkedIn has a number of features that enable you to use it as a sales tool to find and connect with prospects, stay top of mind with clients and gather business intelligence. 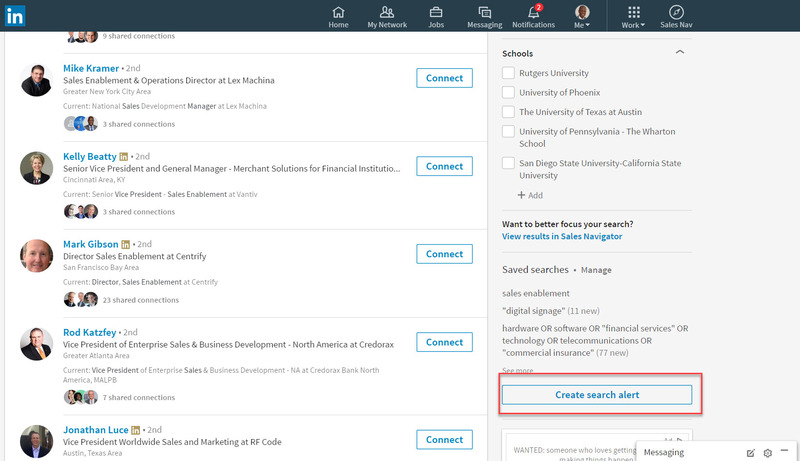 LinkedIn’s Search feature enables you to search for people based on a number of parameters including keywords, location, company, name, industry, title and school. It allows you to fine tune your search to a high level. The Search feature even enables you to save search parameters so you can easily revisit your favorite searches. 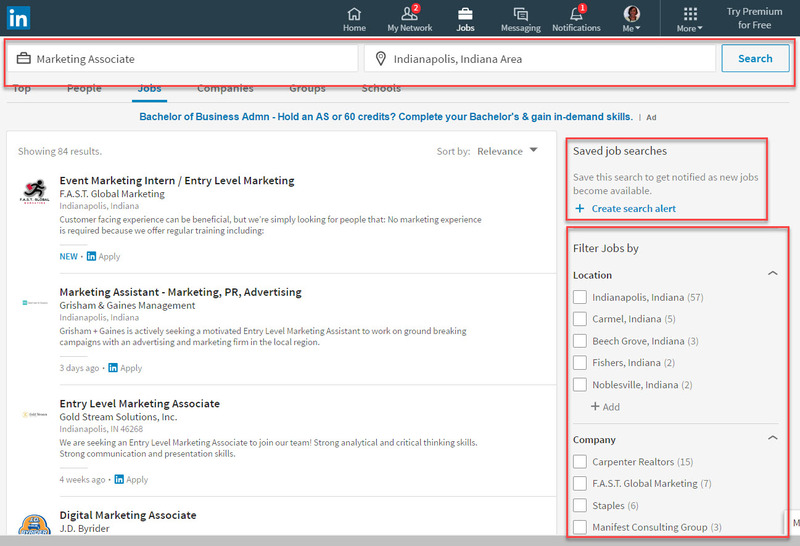 You can save up to 3 searches if you have a free LinkedIn account and choose to receive weekly notifications showing you a list of new people or jobs fitting your search criteria. When you find someone on LinkedIn that you would like to connect with, you can see who your mutual connections are so you can ask for an introduction. In addition, by looking through their profile you can often find areas that you have in common with them that you can refer to when introducing yourself if you do not have a mutual connection. If you and a potential prospect are members of the same LinkedIn Group you can send them a direct message. Currently you can send a message to a maximum of 15 fellow Group members per month. When you view someone’s Profile, LinkedIn provides suggestions on People Similar To and People Also Viewed individuals. The People Similar To feature is helpful if you are looking for other individuals who work in the same capacity as the person you are viewing. 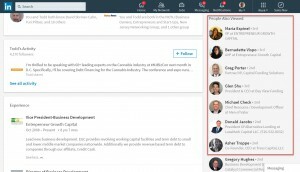 LinkedIn’s algorithm is finding other people with similar elements in their profiles which is a big help if you are in sales or business development. Here are suggestions for a simple, easy to maintain LinkedIn routine that will help you see consistent results. If you have pending invitations to connect, scan the profiles of those who have invited you to see whose invitations you should accept. You can Archive the others. Look at Who’s Viewed Your Profile – some viewers may be valuable connections you will want to contact. 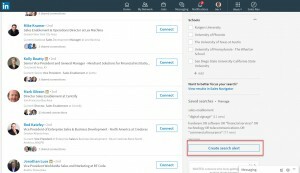 Use the “15 ways to keep in touch” feature to note and acknowledge personal and professional events highlighted by LinkedIn for selected contacts. Based on your criteria for those who would be good business connections invite others to connect with you. You can use LinkedIn’s People You May Know suggestions and use Advanced Search to find people based on specific criteria you choose. Engage in Group discussions where you can add your expertise to the conversation. Like, Share and Comment on posts from others in your network, particularly those from current and prospective customers. Please let us know how you are using LinkedIn for personal branding and sales.